Tennessee Jazz Collective to p.. The MTSU School of Music’s “Keyboard Artist Series” will keep a steady rhythm Friday, Feb. 15, when piano professor Adam Clark presents the masterworks of Bach, Beethoven, Chopin and Mendelssohn in a public concert. Clark’s performance will begin at 7:30 p.m. Feb. 15 in the Hinton Music Hall inside MTSU’s Wright Music Building. A campus map is available at http://tinyurl.com/MTParkingMap. Admission is $10 for adults and $5 for seniors; children under age 18 will be admitted free, as will MTSU students, faculty and staff with a current ID. Tickets, which will help fund the Keyboard Artist Series, are available at http://mtsuarts.com and at the door. The 2018-19 concert series, sponsored in part by the Steinway Piano Gallery of Nashville and now in its fourth season, features MTSU faculty and distinguished guest artists from around the world. Clark, a co-director of the series, has performed as a soloist, chamber musician and concert soloist throughout the United States as well as in Belgium, Italy, South Korea, Sweden and Australia. His performances have been broadcast on U.S. public radio and South Korean TV. A prizewinner in numerous competitions, Clark also serves as a member of the university’s Stones River Chamber Players and a Tennessee Music Teachers Association board member. Before joining MTSU’s School of Music, he taught at Michigan’s Hope College, the University of Cincinnati College-Conservatory of Music and the University of Texas at Austin. During his MTSU Arts-sponsored concert, Clark will perform Alfred Cortot’s transcription of the Largo movement from Bach’s Keyboard Concerto No. 5 in F minor; Beethoven’s Piano Sonata in E flat major, Op. 81a, often referred to as the “Les Adieux” sonata; and a nocturne, prelude, and Barcorolle, Op. 6, all by Chopin. Then, after an intermission, the professor will continue his program with Beethoven’s Piano Sonata in F sharp major, Op. 78, and Mendelssohn’s Fantasy in F sharp minor, Op. 28. Clark originally was scheduled to perform a duo recital with pianist Eunbyol Ko, his wife and fellow MTSU music professor, for the Keyboard Artist Series but is now presenting a solo recital. You can get a preview of Clark’s performance with his excerpt from Mendelssohn’s Fantasy in Fsharp minor below. The Keyboard Artist Series will conclude its season Friday, March 29, with a concert in Hinton Hall by Jon Nakamatsu, winner of the 1997 Cliburn Competition and co-artistic director of the Cape Cod Chamber Music Festival. Nakamatsu also will help MTSU celebrate “Piano Day 2019” Saturday, March 30, by spending the day as the guest artist for and teaching two sessions of the Piano Masterclass Series. For more information on Piano Day 2019, visit http://mtsu.edu/music/masterclass.php. 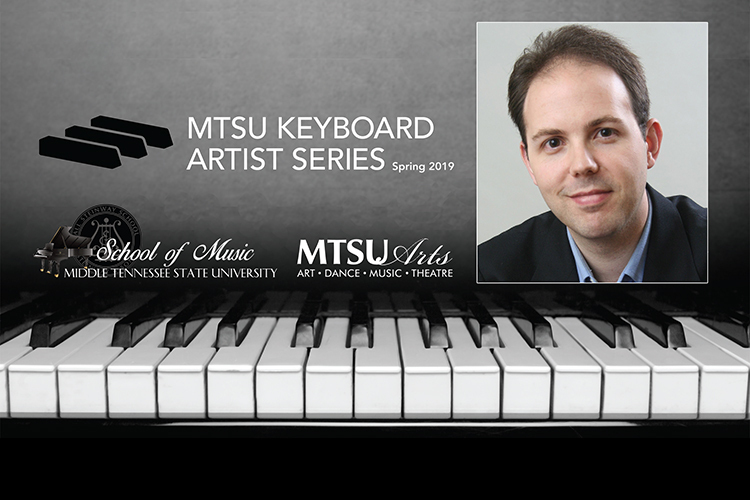 For more information on MTSU’s Keyboard Artist Series, visit www.mtsu.edu/music/keyboardseries.php. For details on other School of Music events, call 615-898-2493 or visit the “Concert Calendar” link.